A new version of of the AHP Excel template with some major updates is now available for download. Based on the work of Tomashevskii (2014, 2015), errors for the resulting priorities/weights are shown. In addition the overall dissonance (ordinal inconsistency) according to Sajid Siraj (2011) is indicated. The zip file for download also contains the updated manual, showing the calculations and references. the international symposium on the Analytic Hierarchy Process ISAHP 2018 in Hongkong is just finished, and I gave two presentations in the track Multi-criteria Decision Analysis – Methodology and Theory. One about the AHP balanced scale, and the other about the implementation of my AHP online software AHP-OS. I’m thankful to the program committee to have received the most innovative idea reward for the paper about AHP-OS. Some interesting papers were presented, for example Cardinal and Ordinal Inconsistency in pairwise Comparison Matrices by Konrad Kulakowski, or Coherency: an Innovation to Test Data Quality and Reduced Comparisons in the ANP by Orrin Cooper, just to mention two. I will update you with the link, once the conference proceedings are published. The conference gave participants also an opportunity for many discussions and the exchange of ideas. Please continue to support my effort, either with a donation, or a rating to my web posts, which will help me as a feedback to my work. For now, please enjoy your visit on the site and feel free to leave a comment – it is always appreciated. And don’t forget: Better to be approximately right than precisely wrong. I wish all of you a Happy and Prosperous New Year 2018! From July 13th to 15th the International Symposium on the Analytic Hierarchy Process (ISAHP) for Decision Making takes place in Hong Kong. Poster submission is possible from Nov 1st, 2017 to Mar 15th, 2018 and individual paper submission from Nov 1st, 2017 to Mar 6th. Early registration deadline May 15th, 2018. More Information about the ISAHP 2018 can be found on their website. After my last participation in 2013, I plan to attend the conference in July. If you want to meet me personally, feel free to contact me. I submitted an individual paper about the implementation of my AHP-OS software; it is a short version of my detailed working paper. In additon I will probably submit a short version of my paper Comparison of Judgment Scales of the Analytical Hierarchy Process – A New Approach. 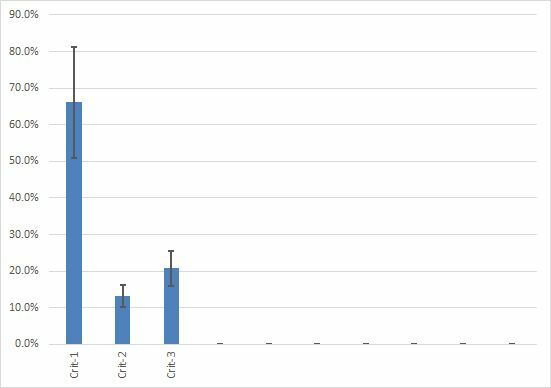 This paper was submitted to the International Journal of Information Technology and Decision Making in June 2017, and is under review since then. All attempts to contact the editors and to find out, why the review process takes so long, were unsuccessful. My AHP-OS software has now reached nearly 6000 registrations since its implementation in 2014. It should be quite stable and without major bugs. Unfortunately, there is still a minor sporadic problem with the storage of pairwise comparisons. It appears in 1 out of 1000 projects that a set pairwise comparisons just disappears. I am still trying to find the reason, kindly contact me, when this happens to you, and let me know the circumstances (It seems to have something to do with the browser and stored session data). Please continue to support my effort, either with a donation, or at least give a 1 (poor) to 5 (excellent) rating to my web posts, which will help me to get some feedback on my work. For now, please enjoy your visit on the site and feel free to leave a comment – it is always appreciated. You have a complex hierarchy with many nodes to be evaluated. Now participants can start a partial evaluation, save the judgments and complete the remaining nodes at a later time. As a participant you are only expert for a subset of nodes in the decision hierarchy. As a chair you can now ask participants to give their inputs for a few nodes of their expertise only. Pairwise comparison input is started as usually: either using the link provided on the project session page, or using the link AHP Group Session on the AHP-OS main entry page. After providong session code and name, in case the participant hasn’t given any input, a message Ok. Group has x participants. Click “Go” to continue will be displayed. Nodes without judgment show the AHP button with red outline. The latest update of AHP-OS comprises of some minor changes to make the program flow easier to understand for participants w/o background in AHP. The group session input screen does no longer show the headline to login or register, as for participants there is no need to be registered. The text introduction was shortened to two and a half line of text. Menu buttons intended to be clicked are highlighted. It is now possible, to analyse the weight uncertainties in your AHP-OS projects. When you view the results (View Result from the Project Administration Menu), you see the drop-down list for different AHP scales and a tick box var is shown. Tick var and click on Refresh. All priority vectors of your project will display the weight uncertainties with (+) and (-). over the last four months I put in a lot of effort to improve the AHP-OS online tool. With several releases a simplified menu structure and new features were introduced. Delete individual participant’s inputs from an existing project. Update a project hierarchy or project description, as long as there is no input. 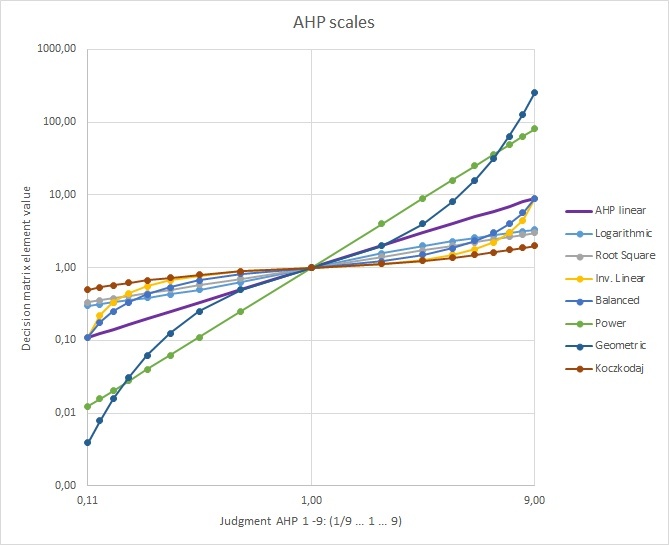 Evaluate your AHP projects using different AHP judgment scales. Analyse weight uncertainties based on small randomised variations of input judgments. The last two features are based on my recent study about the comparisons of different AHP scales. Up to date there was no recommendation, what scales to use, and I found a new approach to analyse and compare the scales based on simple analytic functions. This study is submitted for publication, and I hope it will not take too long, until it is available. You can find some more information already in my posting here. The feature of analysing weight uncertainties is an innovative way of doing sensitivity analysis: all judgments are randomly varied by ±0.5 on the judgment scale, and for each variation the maximum and minimum out coming priorities are captured. I use 1000 variations, enough to get a relatively stable margin of errors for each weight. It gives you information, how “precise” a weight or ranking is in your specific project. Again, a big Thank You to all donors! Please note that the website is a non-commercial website for educational purposes. Your donation is used to cover running costs like web hosting, antispam services etc. PLEASE, help to support this website with a small donation. I spend a lot of time, sharing my knowledge for free. Thank you in advance! Please give credit or a link to my site, if you use parts in your work, or make a donation to support my effort to maintain this website. Fig. 1 Mapping of the 1 to 9 input values to the elements of the decision matrix. In the project menu of the latest AHP-OS version (2017-05-25), I added a button to edit saved projects. As long as there are no participants’ inputs (completed pairwise comparisons), any saved project’s hierarchy, alternatives or description can be modified. Based on feedback from users, I just released a major update of BPMSG’s AHP online software AHP-OS with simplified menu structure and additional functionality. Starting the program as registered and logged-in user, the project session table is displayed, showing your projects.